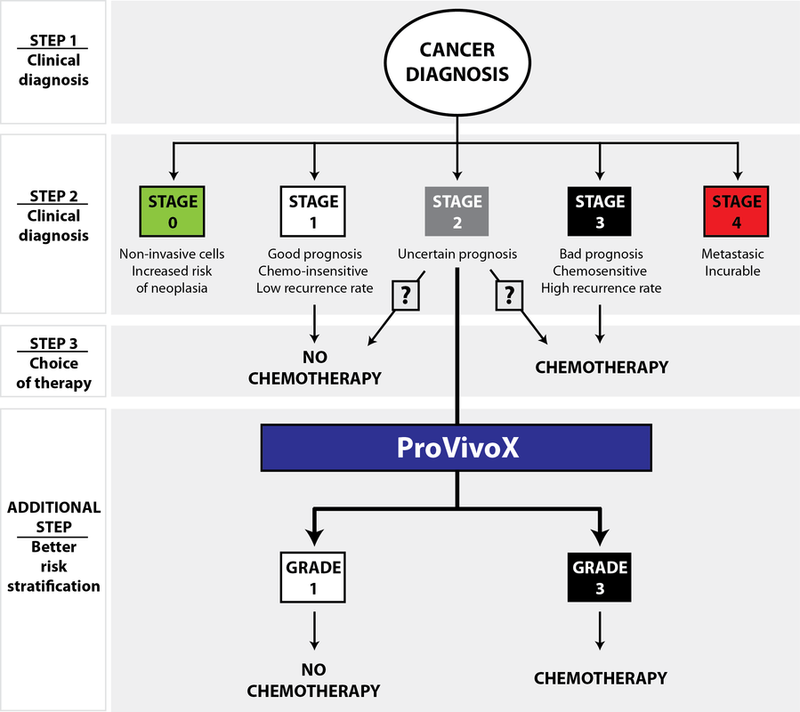 ProVivoX is a company with a single goal in mind : identify cancer patients who would benefit from chemotherapy based on biological characteristics of their tumor. Even with all the recent findings on cancer, a high number of cancer patients are not correctly diagnosed because their tumor is wrongly characterized. The particularities of cancer cells are often difficult to identify by standard medical methods, which yields a high number of patients who have the wrong treatment for their needs. Because of this, people who will never benefit from drug treatment have to endure difficult chemotherapy, while some others are not treated while they should be... Novel methods now exist that allow a direct characterization of distinct traits of the tumor, but very few products derived from these technologies are now freely available to patients. The goal of ProVivoX is to research and market a protein-based prognosis test to fill this crucial gap. 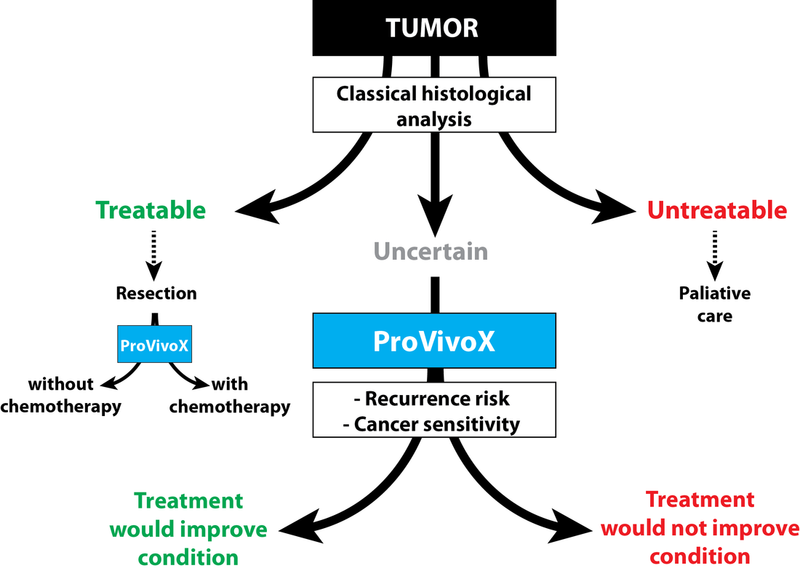 ProVivoX Inc. aims to provide accurate survival prognostic tests to clinicians, such that they may select the best treatment option for each patient in accordance with the prognostic result, as well as to cancer patients to inform on their lifestyle choices. ProVivoX's short-term objective is to establish a prognostic algorithm to predict cancer patient survival using ratiometric biomarker analysis of tumor tissue. While presently available tests often base their prognosis on the detection of a single biomarker, the ProVivoX test relies on the relative expression of several biomarkers to predict the extent of individual patient survival and, potentially, therapy response. 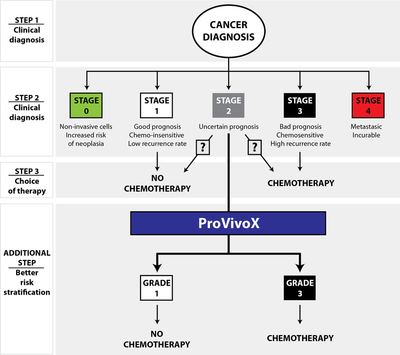 In order to provide a more comprehensive analysis of an individual’s cancer, the expression of multiple protein biomarkers is analyzed using a validated multiplex method coupled with a high-end visualization technique and specific statistical algorithms.